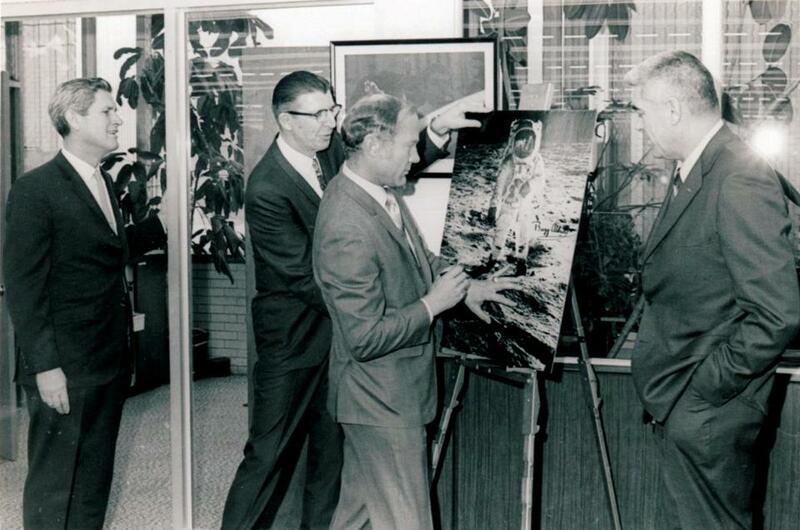 NASA astronaut Buzz Aldrin visited Harmonic Drive in 1971, to thank employees of the Peabody company for their work on the lunar rover. One of the most improbable and impressive companies that Boston has ever known is run out of a single-story brick building in Peabody. Its product was invented in 1957, but still sells for hundreds or thousands of dollars. The product has been manufactured in Massachusetts consistently since around 1960. And it currently sits on the surface of Mars, on the moon, in the International Space Station, and in operating rooms and factories here on earth. My bet is you’ve never heard of the company, Harmonic Drive, or its product, the strain wave gear. I hadn’t, either — and I’ve been covering tech in Boston for more than two decades. But Harmonic Drive is a company that has remained relevant through several generations of innovation, and is still relevant today — not to mention growing. What’s nice about Harmonic Drive is that most of the gear units it makes will fit in the palm of your hand. They’re made of stainless steel, so they have a heft to them. There are a couple dozen ball bearings inside that spin pleasingly as the gear rotates. Aside from the bevy of ball bearings, the circular gear unit has just three parts, each of which sits inside the next. It’s designed to be light and compact, but the piece produces a huge amount of torque and extremely accurate movements. That’s pretty important, for instance, if the gear is inside a surgical robot that is performing hip replacement surgery on your mom. 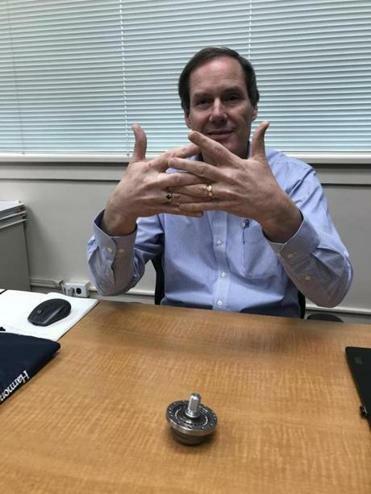 “Typically, gears are big, bulky, heavy, solid devices,” says Douglas Olson, Harmonic Drive’s CEO. They also have something called “backlash,” which refers to the extra space and movement between the teeth of two interlocking gears. Harmonic Drive says its gear units operate with no backlash, which makes them precise. The design was created by Clarence Walton Musser, an inventor who received more than 200 US patents before his death in 1998. And it was created for one of the most dominant Massachusetts companies of the 20th century, United Shoe Machinery of Beverly, which not only made equipment for shoe production, but also developed tank and aircraft turrets during World War II. Harmonic Drive is led by chief executive Douglas Olson. Like a lot of other inventions, no one was sure initially what to do with the strain wave gear. There were explorations of whether it was feasible to use the new gear to drive helicopter rotors or to remotely move fuel rods in nuclear power plants. But Harmonic Drive “really started to grow,” Olson explains, in the mid-1970s, as robots found their way onto assembly lines and evolved from being powered by hydraulic fluid to electricity. The company, which began life as a division of United Shoe Machinery before spinning out, also saw some early success in selling to NASA: One of its gear units was used to drive the wheels on the lunar rover that traveled to the moon as part of the Apollo 15 mission in 1971. That year, astronaut Buzz Aldrin dropped by the Harmonic Drive office to thank the employees for their work on the rover. Olson nonchalantly mentions that you can also find Harmonic Drive’s gear units onboard just about every GPS satellite that orbits the planet, “typically to move solar panels or communication antennae,” as well as on the Mars InSight lander, which touched down on the planet in November 2018. NASA also built the company’s gears into Mars 2020, another rover that is scheduled to launch next summer. Own anything with a microchip inside? Harmonic Drive’s gear units can often be found inside the automated equipment at chip fabs, the production facilities that make microchips. Inside Harmonic Drive’s own factory in Peabody, there’s a small gray-and-blue robotic arm helping to assemble gear units; yes, there’s a Harmonic Drive gear unit inside the robot that makes Harmonic Drive gear units. Harmonic Drive is owned by a Tokyo-based parent company, Harmonic Drive Systems, which was originally the Asian licensee of the strain wave gear that United Shoe Machinery developed. The company as a whole has been on a tear: its revenues nearly doubled from 2017 to 2018, hitting about $500 million, though its stock has been dropping over the past year after an extended rise. It’s pretty hard to think of technology products invented in 1957 — the era of black-and-white TVs and Elvis Presley on ”The Ed Sullivan Show” — that are still sold today. Much less made in the United States. When I dropped by last week, there was a “now hiring” banner on the front of the building, and not a single empty spot in the parking lot. (Harmonic Drive currently employs 132 people in Peabody.) Olson apologized on our tour of the plant that some of the walkways had gotten narrower, since there was now equipment sitting in what had once been aisle space. “It’s definitely driven by the advancement of automation,” Olson says, and especially by lower-cost, easily-programmed “collaborative robots” that can work alongside humans. And, he posits, more robots in US factories may help keep manufacturing activities here, or even bring them back from countries where the costs of human labor are lower. Harmonic Drive was born in 1960 in Beverly, at “the Shoe,” as United Shoe Machinery’s vast campus was known. This summer — almost 60 years later — it plans to move back to town, into a newly built facility that will double the company’s current footprint. Its parent company was merged into obscurity in 1976. But Harmonic Drive has managed to survive — and thrive.